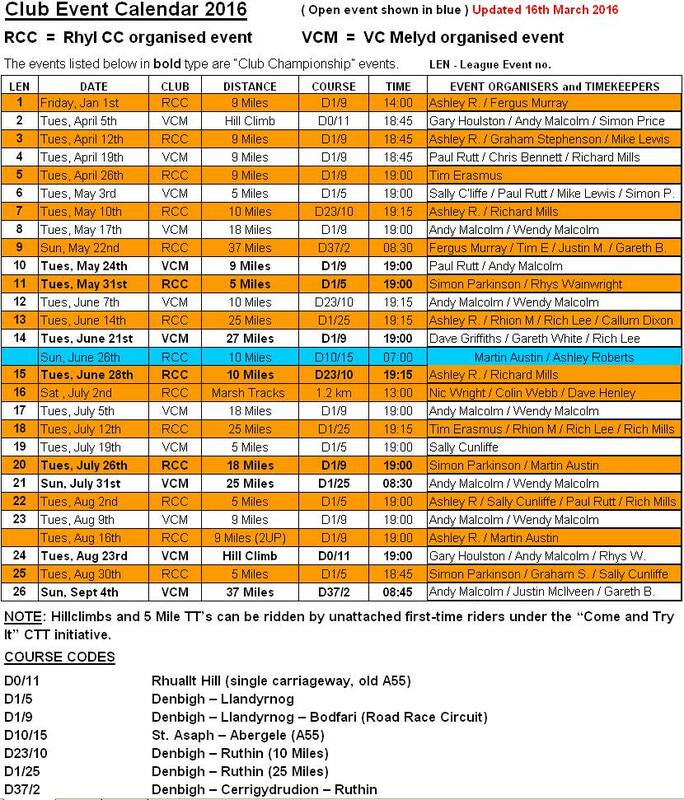 Following the season opening Brass Monkey event on New Years Day we are now to present the North Wales Time Trial Calendar for the Velo Club Melyd & Rhyl Cycling Club. After a great season last year with the usual awards and champions – this year is no exception – a full season to acrue not just personal bests, compete against your clubmates, but also to compete for points and as Club Champion for your specific age group. New for this year, starting Wednesday 1st of March 2017 we will be moving the usual Tuesday Night Club Ride to Wednesday nights. Thus allowing all those unable to attend to head over and take part as currently this is an issue. While the Hill Climbs and the longer events may not be for everyone – the Championship Events are worthy of your support – play to your strengths people – and appreciate that lower attendaces mean higher points are up for grabs .. dont let the weather put you off! So lets start with those Championship dates for your diaries. The definitive source for information is the VC Melyd & Rhyl CC Time Trial Facebook Group. Please post further questions, or discussions there – or for errors here – contact the webmaster. Cool dry conditions with a light wind greeted those who showed up to take part in the first of this years Time Trials – the Hill Climb. 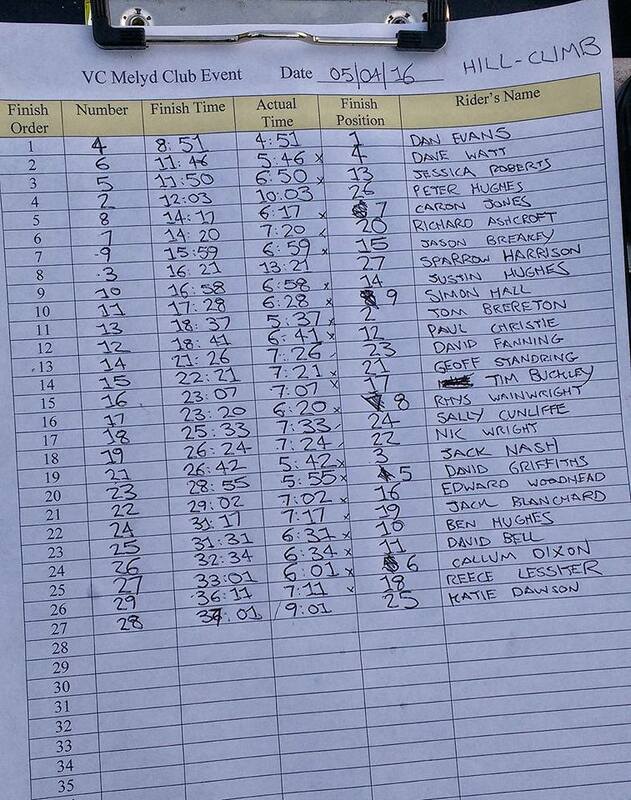 Well done to so many on personal bests – a great way to start the season. This week the schedule for the 2016 time trial programme was posted to the VC Melyd and Rhyl CC Time Trial Facebook page. The Season is split between the two clubs and delivers a variety of events to take part in. This includes Two up, Sprint, 5mile, 9mile, 18 mile, 25mile, 27mile, Hill Climb and the season closing with the 37mile Mountain Time Trial – with the 5mile and HC events open to “come and try” without a club affiliation should you wish to give it a go under the CTT scheme. So – new season, race of truth, you against no one else but yourself – so no matter what your level of fitness, experience, come along – see you there. 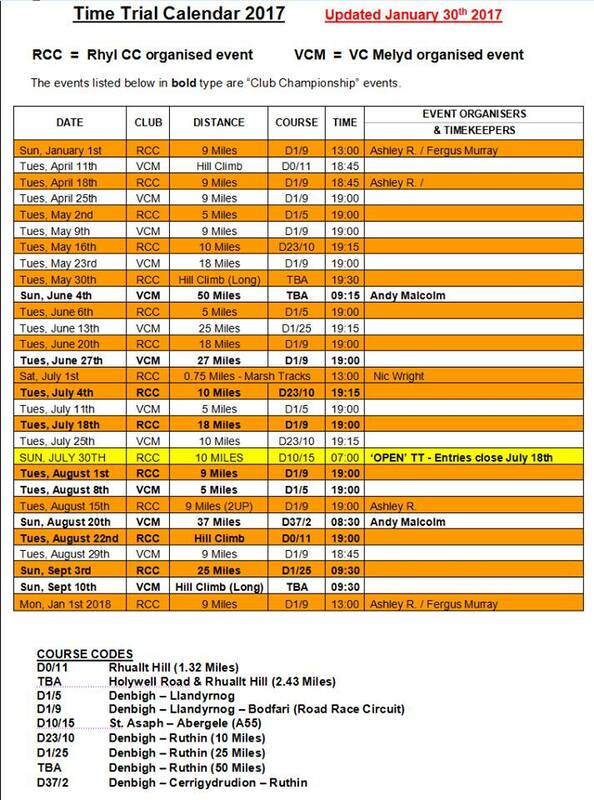 These events have been entered into the VC Melyd 2016 calendar, and are available to print (VCM-RCC-TT-schedule2016) and at the bottom of this post (supplied RCC March 2016) – however be advised these are a guide – dates, times, courses may change closer to the day of the event. Please ensure you check with the organiser before hand to avoid disappointment. Equally you are reminded that we are not the only game in town – and should you wish to supplement this with other courses, days, events, then Rhos On Sea CC are also offering a full TT season you may wish to check out. All first sign VC Melyd members are welcome to take part. Entry fee of £5. Please check out their Rhos TT page for more specifics , requirements, start points and so on. As always check with the organiser before hand to avoid disappointment.